Choosing a good builder for the vast majority of homeowners is a difficult process. All too often we rely on word of mouth and referrals, and whilst these can play a part in the decision making process, the best advice is to learn exactly what good brickwork and extensions should look like, so you can make that call yourself. What about reviews? The problem with reviews and referees is that no builder in their right mind is going to give you the name and contact number of someone who is going to give them a bad reference. Even well known websites that promise to find a good tradesmen are flawed because they simply rely on reviews, left by untrained individuals who couldn’t tell you if an extension has been built correctly or not. Remember, reviews can easily be manipulated, so they should be taken with a pinch of salt. What can’t be manipulated is the quality and workmanship of their work, and if you arm yourself with a little building knowledge, this goes much further and allows you to make a decision based on quality and your understanding of good workmanship, rather than a review by someone who is completely untrained. Was it really their most recent work? Why such a long gap? Good builders generally have a waiting list. You can also see if your local planning department has details of the work and when was the planning permission granted. I also recommend that you ask for the name and number of a client who had work carried out two or more years ago. A good local builder will have no issues in giving you such information. The reason we want two years or more is because building problems often take a little time to come to light so by inspecting and speaking to a previous client of around this time, you get to gain a bigger picture of the builder and the longevity of their work. So what is good brickwork and workmanship? The most simple way to determine if the builder is good and takes care of their work is to look at the brickwork itself. A simple way is to check to see if the joints are straight. 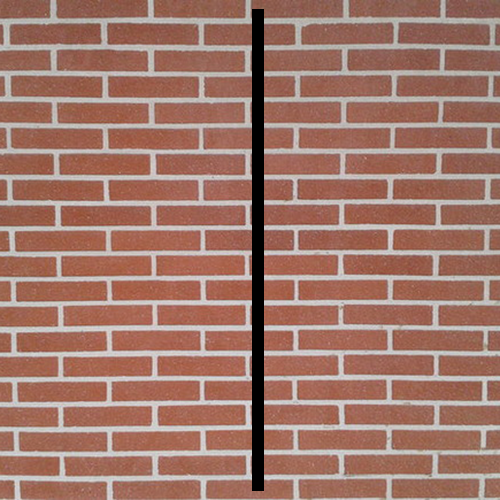 Here is an example of a wall that has straight joints. We’ve put a straight black line on the image to demonstrate that the brick joints on every other course are plumb and nicely aligned. Of course some deviation away from absolute perfect is acceptable, but if the joints are all over the place, this indicates poor workmanship. It doesn’t matter whether you are looking at a garden wall, or a large wall of a house, good brickwork should feature nicely aligned joints. Another way to determine good workmanship is to look at the brick joints. Typically most joints on modern houses feature bucket handle joints. These are semi circular in nature and are designed to prevent water penetrating the joints and cavity. If you see cracks, holes, joints that are not full, or snots (this is where cement protrudes from the joint), then this is a sign of poor workmanship and finish. 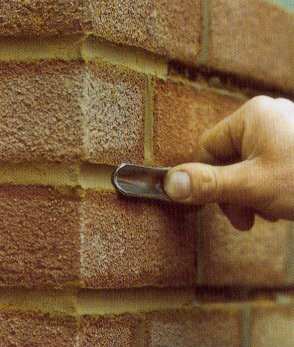 It doesn’t matter whether you are inspecting facing bricks or blockwork, the joints should be full and consistent. Banding is where you get inconsistency with brick colours. When building large walls (i.e. houses and extensions) many packs of bricks will be required. A good builder will ensure that they select bricks from each pack as they progress with the build. 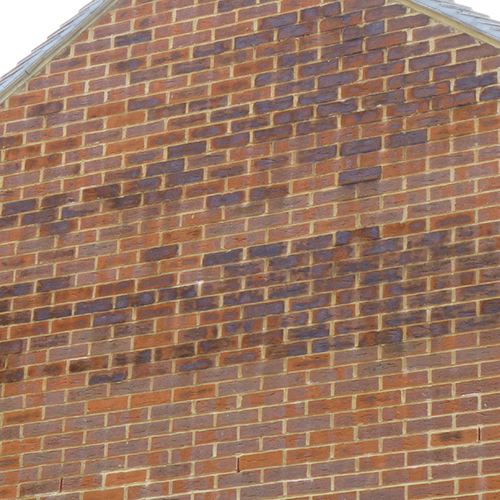 Here is an example of where you can see an accumulation of darker bricks in the same proximity. This indicates that bricks from the same pack were repeatedly taken, rather than taking bricks from each pack along the way. It's unsightly and an indication of lazy craftsmanship. Above windows and reveals, lintels are installed to ensure that any load is spread accordingly. Weep holes (vents) are made from plastic and are 10mm in width. They should be placed above windows and doors no more than every 2 bricks. 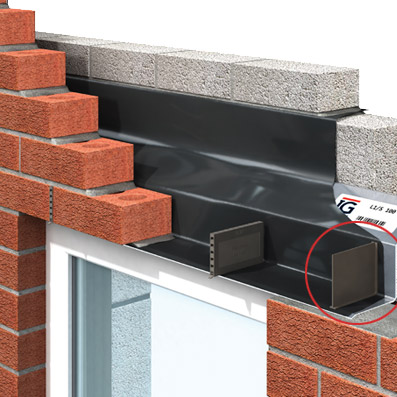 These weep holes are essential to ensure that if any moisture or water manages to breach the cavity above the lintel, then it can be dispersed accordingly. They also allow the cavity to breath. If you see windows and other reveals without weep holes, then this could lead to problems with internal damp in the future. 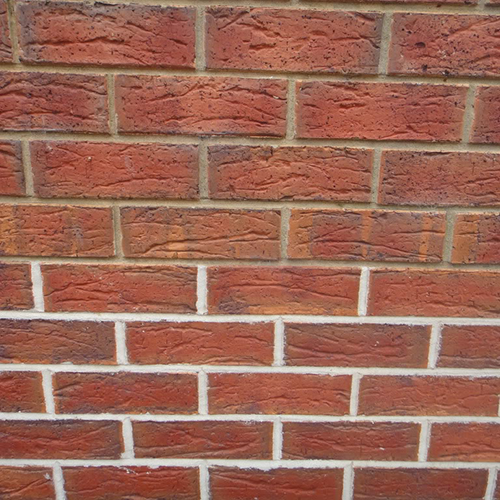 One of the very basics of good brickwork is to ensure a consistent colour of mortar throughout the build. All too often we see contrasting mortar where different ratios of sand to cement have been used and we get an unsightly finish (see image). A good builder will ensure that they consistently mix the cement to the manufacturers recommendation and it dries to the same colour throughout. 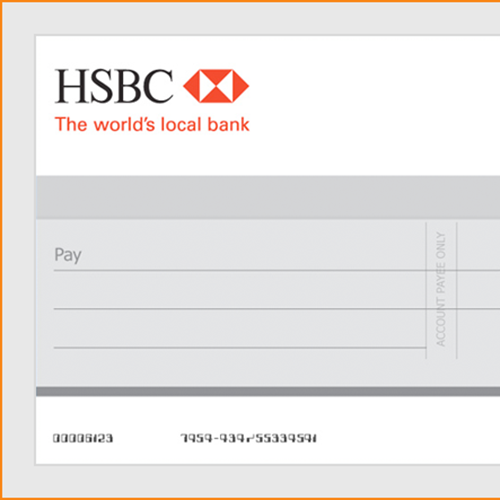 This one can be a little controversial amongst builders, but the reality is a good builder should not really require any payments in advance. Larger builds (i.e. housing developments) may require financial advances, but if a builder asks for payment upfront for the materials, then be sure to ask them for a quotation breakdown. It would be fair to agree two payment schedules, advance payment for the materials and the balance on satisfactory completion.